Explore the treasures of Southern France, starting in Lyon and journeying south to the beaches of the Mediterranean. 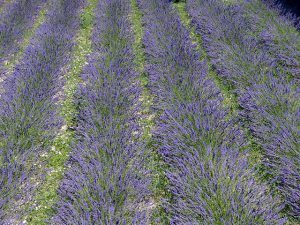 Along the way, we’ll hit both the Northern and Southern Rhone, the lavender fields of Provence, some of the best Roman ruins in Europe and the beautiful beaches of Nice. Start off your adventure by arriving at Lyon airport and settling in to our luxurious hotel. 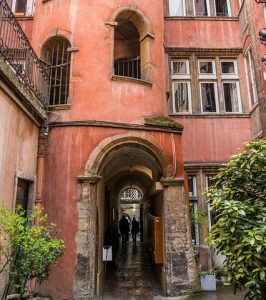 After you get settled, spend the first day on your own exploring all that UNESCO Heritage Site listed Lyon has to offer. On the evening of the first night, join us for the signature Bacchus Discovery Dinner and meet and mingle with the group while learning about the wines of southern France. The second day will start with a tour of Les Halles, the historic market named after native son and famous chef Paul Bocuse. After the tour, you’ll be free to explore the market and sample some of the wares for lunch. After the market, you can spend the rest of the day exploring the museums, parks and gardens of lovely Lyon. It’s time to depart fair Lyon and head in to wine country! Our first stop will be in Valence, a historic city and the gateway to the northern Rhone. This is known as Syrah country, but the whites are excellent, too. 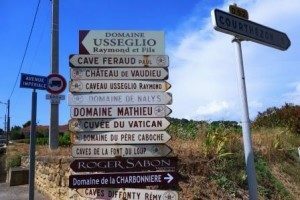 We’ll board our luxury coach and start our journey south with a stop in Côte Rôtie, where we’ll meet our first producers and get a taste of the wines of the northern Rhone. After a few samples of the Côte Rôtie’s juice, you’ll have some free time to explore the charming small town before we head into Valence to settle in for the night. Once we get settled into the hotel, we’ll walk to dinner together. 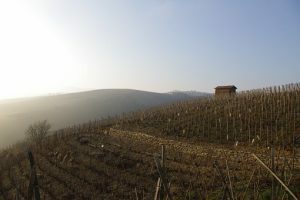 After breakfast and a chance to explore a bit more, or just enjoy lingering over your coffee, we’ll head over to Crozes-Hermitage to enjoy of Syrah before we go south to the land of Grenache. Today, we’ve got appointments set with a couple of different producers in the area. After our tasings, we’ll enjoy lunch before we make the drive down river to Avignon. Once we get settled in, you’ll have a night to explore the historic seat of the Popes on your own. The new home of the Pope welcomes you today. This famed region deserves a day all to itself and we’ll give you one. We’ve set up appointments at producers you’re familiar with and also a few that will be your new favorites. We’ll set up a great lunch in the village and give you some free time to walk around and pop in and out of the many, many tasting rooms which dot the streets of this remarkably small town. We’ll also check out the ruin that is the old Papal palace which gives the village its name. After we’re done tasting here, we’ll head back in to Avignon for some time to explore or just relax. The southern Rhone isn’t all about CDP (although if that were all, it would still be enough!). These two smaller appelations are some of Kat and Dan’s favorites, both for the views and for the juice. We’ll spend the morning in Vacquerays at some smaller producers and then get lunch at a hidden gourmet restaurant tucked in the center of beautiful Gigondas. After a chance to walk off lunch, we’ll head into the mountainous terrain around the city to taste some of the Rhone’s best-kept secrets. You’ll have another evening on your own tonight to continue to explore Avignon. 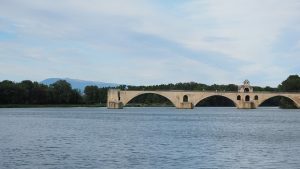 Alternatively, cross the river and explore Villenueve de Avignon, where the French king set up shop to keep an eye on the Pope when he was keeping court in Avignon. 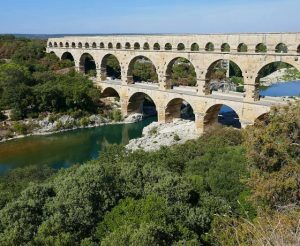 In the morning, we’ll take a (brief) break from sampling wine and go visit the Pont du Gard, one of the best preserved examples of Roman aqueduct architecture that survives. We’ll walk through the preserve which surrounds the Pont and explore the Rhone up close. 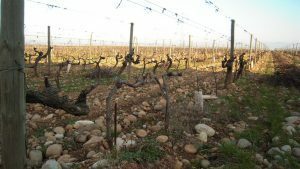 After that, we’ll get back to tasting wine with stops in Tavel and Lirac. Both regions make delightful reds, but are most known for their dry, rich rosé wines. If you think all pink wines are just for beginners, today is the day where we’ll change your mind. Rosé is perfect for the summer and a great go-to for the nights where you want meat and your dining companions have their hearts set on seafood. In the morning, we’ll board our coach and bit farewell to Avignon. It’s time to head to the beach for some R&R. On the way, we’ll stop in Arles, where Vincent van Gogh lived and worked. 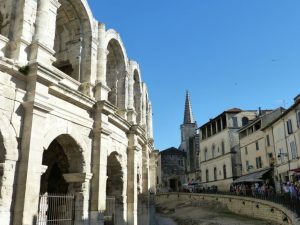 Arles is also home to a large number of Roman sites, the French national school of photography and an arena where Provencal-style bullfights are still held. (Don’t worry, they don’t kill the bulls in this type of fighting – the goal is to remove a tassel from the bull’s horn without the bull killing you.) Arles is a great introduction to the amazing blend of cultures in Provence. We’ll have a fantastic lunch after seeing a few sights together and then you’ll have time to wander, shop or just adopt the southern French pasttime of sitting in a café watching the world pass by. 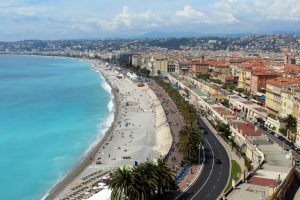 Then it’s off to Nice for some sun and surf. One last day to explore the beautiful wines of Provence. We’ll head out of the city for some of the elegant rosé and rustic reds of Provence. They both pair well with the region’s Mediterranean cuisine, especially a fresh and spicy bouillabaisse. We’ll also spend a few hours exploring the art village of St. Paul de Vence. Whether your taste is modern, classic or even fringe, the numerous studios, galleries and workshops in Vence will delight. We’ll enjoy lunch in Vence before heading back towards the sea in time for a glass of wine while the sun sets into the Med. After the sun sets, you’ll have the night to find a seaside brasserie, walk along the sea or hit one of the many clubs which Nice is famous for. Your feet in the sand or shop til you drop? Either way, Nice has it all. Take your last day to head off on your own. Explore the Promenade Anglais and the Beaux Arts hotels that hug the coast, see some more history by exploring the many cathedrals, museums or ancient Roman sites in the city or stop by some of the fabulous boutiques which abound in this capital of French style. Once you’ve had a chance to relax, it’s time to get ready for the farewell dinner. We’ll head out together for a final night of food, wine and friends. If you haven’t had enough vacation yet, you can head to Italy with us for some Tuscan Treats or extend your stay in Nice, Paris or Monte Carlo.